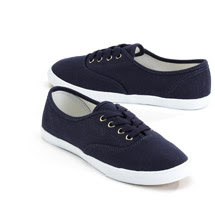 remember these anthro shoes i wanted to copy? well, they didn't quite turn out how i envisioned, but not bad for my first try. (without detergent) to get the bleach out. i went a little overboard on the bleach because i couldn't tell if it was working. note to self: hold your crazy-horses. bleach takes more than 15 seconds to work. so... they kinda look like a tie-dyed saddle oxford. light on the toes and heels, dark in the middle. i think next time i will go for more of a splattered look, or maybe even dip-dyed. it'd be cool to have them get progressively lighter at the toe. i also went a little crazy on some t-shirts while i had the ol' clorox out. i'll post those later. after all that work, the shoes are actually a teensy bit small on me, so watch for them in my shop! wait...what? i don't have a shop? i thought all bloggers had an etsy shop. note to self: get in on that etsy action. I like them... they have a cool ombre effect. Very "destructed chic"!